Creek Road, Greenwich, SE10. With Ben Oakley and Edward Hill. 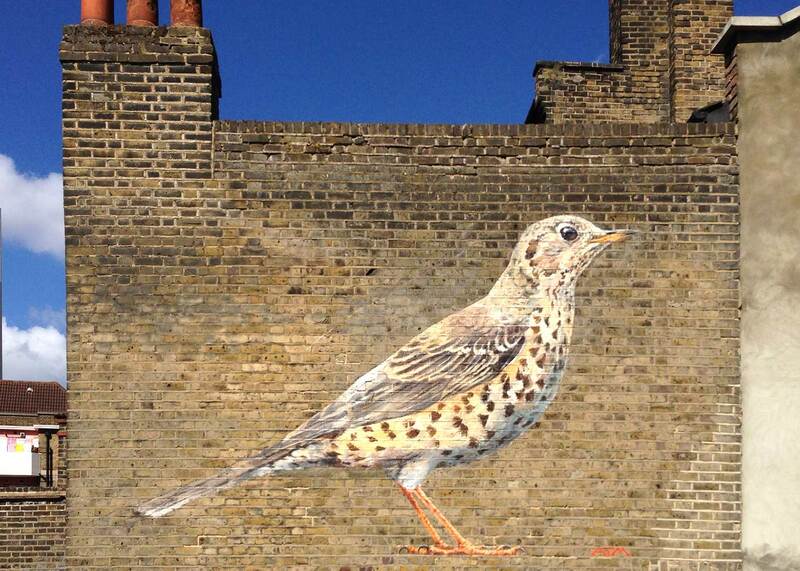 I painted this on a wall facing a small expanse of grass by a busy road in the centre of Greenwich. Mistle thrushes lived here but the land was sold by the Council for developers to build flats. There was a local campaign to overturn this decision, for the benefit of the birds and the people who live nearby. This campaign highlights two issues: the selling off of land by Councils to raise funds, but land which is not theirs to sell, but is our land, public or common land. This is a growing trend, as more and more of our public spaces become privatised. The second issue is that there should be statutory obligations in all new developments to include little natural enclaves to provide at least some space for wildlife. This would also be of immense benefit to the people who live there. All too often developers pay lip service to greening, providing perhaps a single row of evergreen shrubs which is useless for wildlife. Or they take the even easier option of paving. This is considered low-maintenance, yet a thicket of native bushes and wildflowers needs equally little maintenance.